While visiting art galleries and art spaces in downtown Phoenix is the star attraction of First Friday in Downtown Phoenix, there are museums and other attractions on the First Friday route that warrant special mention! Of course, it might take six months worth of First Fridays for someone to enjoy them all, but hey, we aren't in a rush! There are basically three ways to do First Friday, from a transportation perspective. Or, you can combine all three. Drive and park, drive and park, repeat. This was easier when meters in Phoenix were free on Friday nights, but they aren't anymore. Still, there are several free lots where you can Park 'n' Ride on First Friday. Take the trolley, stick to the route. While most of the following places are within walking distance from a First Friday Trolley Stop, some people prefer to drive and not be subject to waiting for a trolley. Openings, programs, hours and charges mentioned are subject to change without notice. Unless otherwise stated, all ages are invited. The Nash: Right on the First Friday route, you can enjoy free jazz performances on First Friday evenings at The Nash. The Nash is owned by Jazz in Arizona, a 501(c)(3) nonprofit organization. Normally the club has a BYOB policy, but it is waived on First Fridays. On other days of the month at The Nash, you’ll find regular, ticketed performances, very reasonably priced, as well as jam sessions (usually free admission). This is an all ages venue. Children’s Museum of Phoenix: The Children’s Museum of Phoenix offers free admission from 5 p.m. to 9 p.m. on the First Friday of each month, with the support of Target. Please enter through the Historic Entrance on the west side of the building adjacent to 7th Street. The Museum is within a few blocks of a METRO Light Rail station. If you have driven, there is free parking, but get here early; it is not unusual for the parking lot to fill up when a couple thousand kids and parents visit. 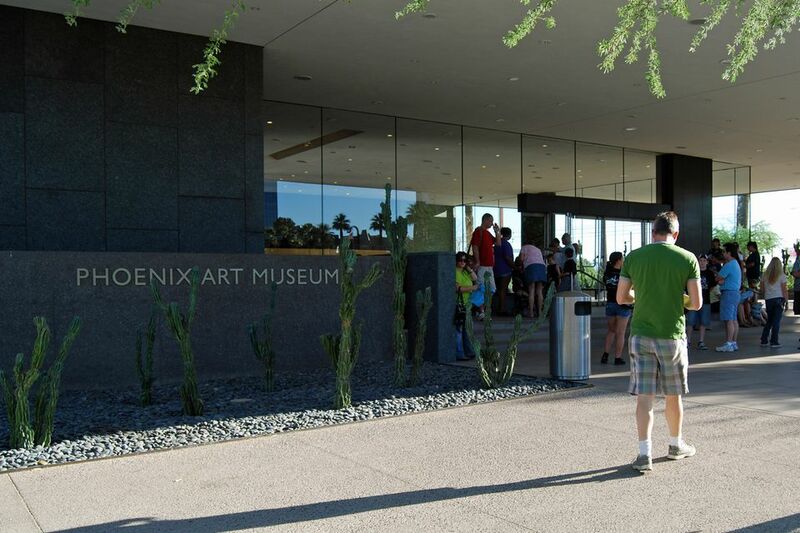 Phoenix Art Museum: Phoenix Art Museum opens its doors to the public with free admission from 6 p.m. to 10 p.m. for First Friday. Special policies and fees may apply to ticketed and special exhibitions. The Museum is directly on the First Friday Trolley Route—this is actually a hub location for the trolley. The Museum is also just a few steps from a METRO Light Rail Station. Burton Barr Central Library: On First Friday evenings, in addition to art exhibitions there, The Library often has special programs on First Friday. Check the library calendar for lectures, music or other activities of interest. The rest of the library is not open. The Burton Barr Library is a few steps from a METRO Light Rail Station, but there is also free parking there. Civic Space Park: On First Friday evening you can usually find food trucks, local musicians performing, and other activities in addition to the A.E. England Building Gallery located there. It’s a few steps away from a Light Rail station. Phoenix Center for the Arts: Family Fridays take place during the First Friday event (but not in January, July, and August). If you have young children, but no babysitter, strolling art spaces with your little ones may only be fun for the first ten minutes—and that’s the trolley ride! The Adventures in Art program is designed to be fun and interactive for children K-6th grade. Phoenix Center for the Arts is about half a mile from the Light Rail station, but there is free onsite parking, subject to availability. Japanese Friendship Garden: On most First Fridays (check the schedule online or call) this unique attraction near Downtown Phoenix opens its doors to the public for an evening stroll through the Garden. Admission is free, but donations are accepted. First Friday hours start at 4 p.m. and end at either 6 or 7 p.m. You can take a self-guided tour and a map will be provided. No pets are permitted. The Garden is just a few blocks from a Light Rail station. The 2017 Final Four Teams are Set - Welcome to Glendale, AZ!